Michael is a London cop who like a beer and a laugh despite living neck deep in violence and depravity. He knows that boys will be boys, and in the Turkish district he polices a little crime is expected. Still, the tenuous relationship between known criminals and alleged lawkeepers is maintained well, until that is, the Albanians move in to both the district and the world of illicit activities. With David his new boss eager to impose his will on Michael – with whom he has a past – and the small police team, and the Albanians making astonishingly violent inroads into the local crime loop, Michael is faced with some difficult decisions: will he continue to abide and occasionally profit from the women trafficking, drugs and general standover stuff, or will he make a stand. Hyena could have gone in many directions. It chose perhaps the most uncompromising. This is as far from Liam Neeson in Taken or Denzel in The Equalizer as you can imagine. Some of the acts of violence that punctuate the film are as, frankly, gross and unsettling, as they are sudden. The fact that they seem so casual and matter of fact as opposed to flamboyant acts of bravado is legitimately troubling. These criminals will end a life to send a message the same way you might casually shake your head at the driver in the next lane who gets too close to yours. Then they’ll chuckle while they dismember your corpse so that they can remove the evidence more efficiently. Yes Hyena is an especially adult – and especially powerful – drama. It shouldn’t be viewed by the young and impressionable. This isn’t ‘Schwarzenegger in Commando Rated R’, this is another level. But it wouldn’t be nearly as efficient without the cast and the stylish direction. Peter Ferdinando as Michael is an obvious standout, and on the basis of this alone he deserves to break out just like Tom Hardy did with Bronson, though he seems a bit older and perhaps a little less photogenic than Bane. Or maybe it bothers me that this is so accurate and true to life, and that somewhere on the planet there are those that treat human life with such disdain and a lack of care. Yes. Undoubtedly. There is certainly that also. Final Rating – 7 / 10. 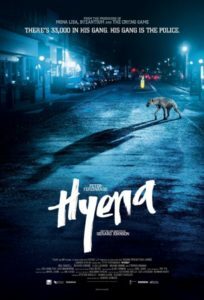 Hyena is a fine film about an element of society that I hope we can move beyond.